Low- carb phase : Dinner consists of foods that contain fat and protein but no carbohydrates contain : fish, meat, eggs, dairy products , oil, avocado , nuts and legumes. A large serving of salad and vegetables provides plenty of satiating fiber. Should then wait at least eight hours before the next meal. As long as it takes , until the fat is completely digested. With a portion of high-quality carbohydrates you stay fit and energetic until the evening. Do continue on the Low-Fat principle. Important: Keep the portions rather small. When insulin levels are not dropped until dinner , save every gram of fat you then consume. The last meal of the day should be comfortable as possible without carbohydrates. For this, you no longer need to be quite as strict with the fat content of the ingredients. Plenty of vegetables and fresh salad saturate protein-rich meat, fish or cheese also crank up the nighttime fat burning. The sooner you then go to bed , the longer holds the " Slim in his sleep " in effect. Strict separation : Try also continue , carbohydrates and fat do not eat together. This reliably prevents you gain after completing the diet. Enjoy welcome: From now on, it comes to maintain the current weight. Therefore, minor compromises in food are allowed. Treat yourself sometimes a piece of cake or a chocolate bar if you feel like it . Permanent bans stir up cravings, instead of preventing it. Food away from home : The restaurant should you rely on low carb, so you are always on the safe side. Choose steamed fish or fried steak with a saturating salad or vegetable side dish. In bread, pasta , rice or potatoes , you should hold back better. Regular weigh only those who per week turns once on the scale, retains control . If you notice that you start to rise again , watch for some time exactly to the separation of fat and carbohydrates - until you are satisfied with your weight again . Weight- loss3.com : What distinguishes the car from the conventional food combining diet ? Prof.Dr.George : The Automotive diet is a successful combination of low-fat and low-carb principle. Both forms are considered individually relatively unbalanced and thus almost impossible to maintain over a long period of time. However, in combination, they provide the body but with all the necessary nutrients and direct the metabolism automatically in the direction of ideal weight. Unlike other diet programs you have to include in the automotive diet neither calories nor calculate fat or carbohydrate amounts . You can ( almost) eat anything you like, just have to be careful not to eat fat and carbs together. How do you explain the rapid weight loss success? The nutrient composition is adapted to the own biorhythm. As a result, the body is at least 16 hours on a low carb level. During this period, is particularly effective burning fat. What do you think are the biggest mistakes you lose weight? Many people believe that they would decrease automatically when they eat less. Such resolutions , however, can hold a maximum of three days and not lead to success. Therefore snacks play a very important role. If they are composed of the right nutrients , prevent cravings and increase motivation . And your tip for those who want to lose weight faster ? It's simple: increase energy consumption ! This is only possible with adequate exercise . It is important that you can not the body overwhelmed, three times a week for half an hour loose jogging is ideal. A yellow dot: These foods are very well suited for the low-carb phase. 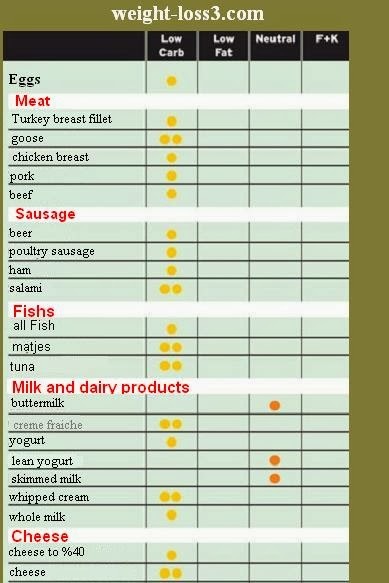 Two yellow dots: These foods are particularly rich in fat and should be consumed in the low-carb phase in moderation. A green dot: These foods are very well suited for the low-fat phase. Two green dots: These foods provide simple carbohydrates or sugar and should be consumed in the low-fat phase in moderation. Oranger point: These foods you should eat all day in between. Yellow-green dot: These foods provide fat plus carbohydrates - rarely, better not eat.